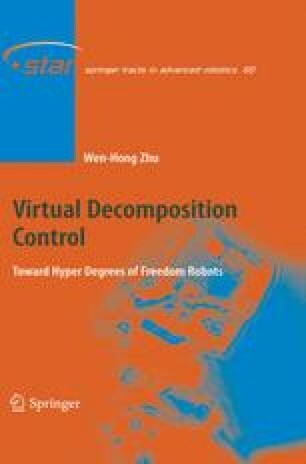 In this section, the general formulation of the virtual decomposition control (VDC) approach will be presented, aimed at achieving a full-dynamics-based control on robots with hyper degrees of freedom. At the beginning, a complex robot is virtually “broken” into “pieces” (subsystems) and is represented by a simple oriented graph. Then, the subsystem dynamics based control is applied to make each subsystem qualified to be virtually stable, subject to certain geometric and force constraints. The virtual stability of every subsystem results in the stability and convergence of the entire robot, in which the concept of virtual power flow plays a vital role in representing the dynamic interactions among the subsystems.